Dare I say it? Spring is finally here. It's my favourite season and I'm always so psyched when the weather starts to warm up. When you wake up to weather pleasant enough you can switch your winter coat out for a lightweight jacket, that right there is bliss. I'm ready for the warmth and a wardrobe refresh. I want to share with you the process of building a minimalist wardrobe from the ground up and I thought spring is a perfect time to do just that! 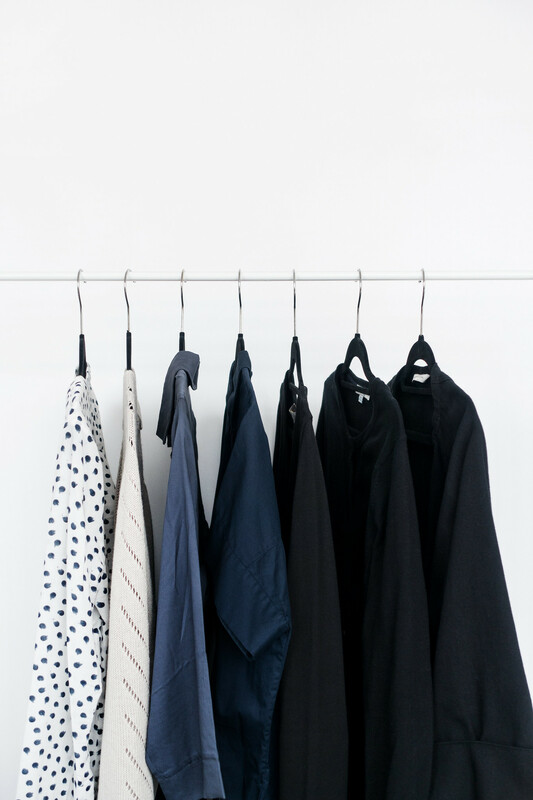 Before even considering a purchase, the first step in starting or making changes to a minimalist wardrobe is assessing what you already own. If you've decluttered, purged your clothes, and done a wardrobe audit you may have a spreadsheet of every item you own. If not, maybe now is the time to consider it. When you're assessing your current wardrobe, bear in mind the three words you want your style to project. How does your current choice of clothing describe your style? Do the two match and if not, what would help you achieve it? My key words are smart, comfortable, effortless and I've discovered my current wardrobe is not quite there, yet. I have several pieces that aren't ideal, which is causing my outfits to miss the mark. It's frustrating and I know exactly where I'm going wrong. I'm settling for less than perfect. I need to invest in better research before pulling the trigger (returning items when they don't work out) and say "no" more to gifted items. As lovely as it can be to receive new clothes on the regular and as wonderful as they look and feel, they aren't always exactly what I'm looking for. I also have a handful of items that are on their way out, I need to start looking for replacements. Whether you've pulled all your clothes from your wardrobe or are consulting your wardrobe audit spreadsheet; identifying your sticking points and assessing your wardrobe's weak spots is a must before trying to edit or add to your wardrobe in any way. Where do you feel you're going wrong with your styling choices? How can you improve your wardrobe? Where do you need to focus your attention? After assessing your current wardrobe, it's time to edit. Ask yourself: When was the last time I wore this? How does it make me feel? Does it fit well? Is it comfortable? Does it make me feel confident? Do I enjoy wearing it? Any clothes you dislike wearing, make you uncomfortable, don't suit your style or reflect your three key styling words: edit them out. Unless you feel you need to keep something until you find an adequate replacement, get rid of any pieces you reluctantly and infrequently wear. It will instantly lighten your wardrobe and your mood. A new method I'm trialing is separating my "not quite right" pieces from the pack and placing them into a sort of quarantine. That way I can see exactly what I'm dealing with. I have a couple of pieces in there that need replacing because they're starting to look old and a couple where I missed the mark with my choice. It's a useful trick to single out pieces that would otherwise get lost in the mix. If you've edited your wardrobe, trimming out the excess, organise the remaining clothes in a way that makes sense to you. A useful basic method is organising by type, style, and colour; blocking clothes by type like this makes for a wardrobe easier to navigate. Invest time in reworking outfits, researching options, and creating a wishlist. It's really important to focus on making what you already own work or at least trying new outfit combinations. You might think you need a new piece to bring an outfit together when really you already have something that will work just as well. Invest a little time in playing with what you've got before researching new items to add. Once you're certain your wardrobe is missing that extra something you can start researching options and building a wishlist. Start with a bullet point list of items listed by type, keep it brief with a maximum of five types. These are items you feel your wardrobe is missing. This list helps focus your attention on specific items and prevents impulse purchases or a wishlist full of items you are lusting over but your wardrobe doesn't need. If you're someone who is easily distracted when clothes shopping, keep separate wishlists. The goal is to build on your existing wardrobe not replace it. Make use of Pinterest if that helps; I've been playing with cut, shape, and colour on a Spring 2017 board to help improve my outfits. One thing I really want to push myself to do is be more inventive with my everyday outfits. When I'm working in the studio I tend to throw on one of three "work uniforms" and be done with it. This, I suspect, is leading me to feel lacklustre about my style. I want to add pieces that are effortless and comfortable; on my current list I've included a maxi dress, maxi skirt, and Breton top. Three pieces that have the potential to completely unlock the versatility of my existing wardrobe. Once you've research your options and found a few potential buys, it's time to invest. Remember: if it's not perfect take it back. Don't settle for anything less than ideal. There are several ways you can update your wardrobe without spending money. Styling your hair can completely change an outfit or at least how you feel about it; the same can be said for accessorising especially with jewellery. 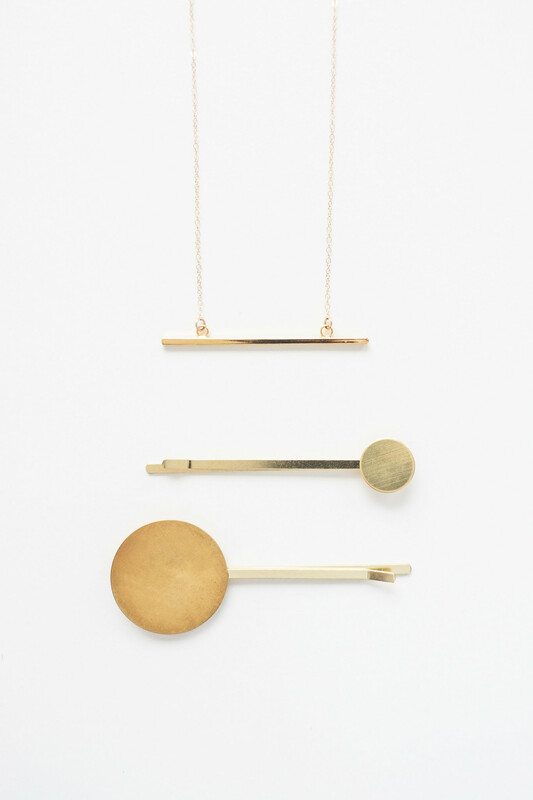 I've been wearing this minimal necklace with pretty much every outfit lately. The bar has a lovely weight to it and the simplicity of its style makes it an understated piece. It's the finishing touch that pulls any look together. Styling my hair is something I've become pretty lazy about and I'm reluctant to change my habits. These hair accessories add a little extra with minimal effort. I twist my hair up and pin it or use the slides to hold a messy bun in place. These two extra touches mean I can play with my style while I wait to find the perfect new pieces for my wardrobe. When you have a final wishlist of "must have" pieces it's time to see whether they are going to work as well as you hope they will. Ask yourself the following questions before pulling the trigger, it'll prevent mistakes and impulse purchases.